In Herstal, an old city block made of hangars and abandoned houses left place to a set of city spaces such as a new train station, housing and shopping facilities articulated around a new public square. The project also includes the refurbishment of a park containing urban vegetable gardens for the inhabitants. -Create a sequence of public spaces that are connected to each other by dealing with the declivity. -Position the station on the city side. The new station is orientated towards the heart of the city, acting as a connector for the different districts around. -Connect the landscape with the city. The sequence of public spaces that is defined connects the hidden landscape in the background (green hillsides) with the valley (the city and its urban fabric). -Bring a new mixity of urban activities to activate the new pole. -Create open spaces as a support for urban life. The project creates a new frame for the public spaces containing a new public square in a part of the city which lacks of that. -Build a sustainable, compact and low energy building. The station has been considered as the opportunity to create a link between two different levels of the city: the lower (the square, the dense urban fabric) and the upper (the trains, the hillsides, the park). The concept of the building-square integrates two main stakes: generate an intermediate level, a belvedere and articulate the different levels of the public space. Different elements allow to connect the different parts of the city. Stairs and ramps create links to different levels and paths and regenerate a green landscape of the hillsides. The tower of the station finds its scale by connecting visually all the different levels of the project. It acts as a landmark for the city, allowing the passengers to directly find their bearings.The tower contains the «direct» vertical circulations such as the elevator and stairs. 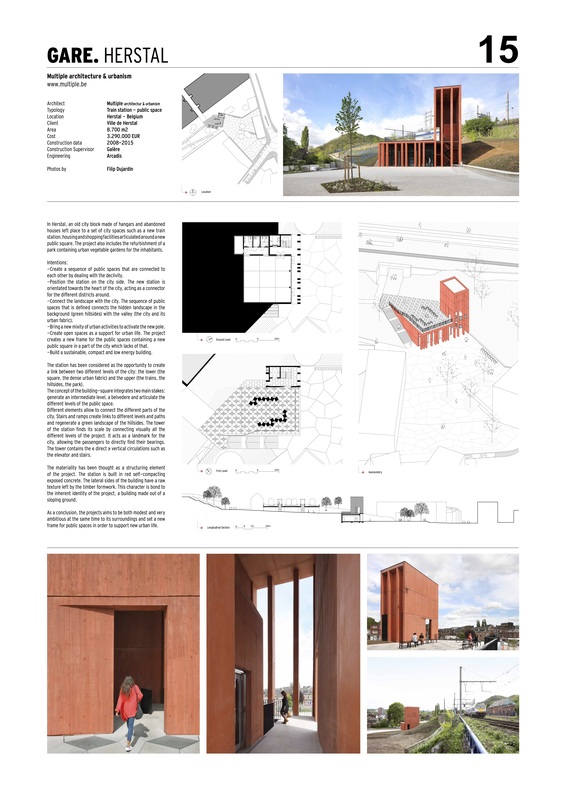 The materiality has been thought as a structuring element of the project. The station is built in red self-compacting exposed concrete. The lateral sides of the building have a raw texture left by the timber formwork. This character is bond to the inherent identity of the project, a building made out of a sloping ground. As a conclusion, the projects aims to be both modest and very ambitious at the same time to its surroundings and set a new frame for public spaces in order to support new urban life.